I hadn't heard of Eat Pray Love before the film publicity started up. Then me and my cousin both bought copies of the book, but neither of us got around to finishing it. So, after leaving it lying on the shelf for the past year, it was definitely time to stop staring at it and pick it up! The book is split into three different sections, each based in a different location and each serving essentially a different purpose on Elizabeth's path to happiness and acceptance. 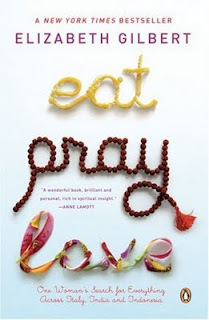 Hence the title Eat Pray Love -- eat in Italy, pray in India, and love in Indonesia. Eat was definitely my favourite part of the book, as it resembles myself the most. I absolutely love to travel and indulge while I'm doing so, and this entertaining account of her time in Italy eating everything in sight, studying the language and experiencing the culture very much appealed to me. Now I am desperate to visit Italy myself and get caught up in it all! Pray and Love are interesting and uplifting, and provide great insight into Elizabeth's mind and her journey, but they didn't appeal to me as much as Eat. These two parts are largely based on spirituality, and so if you're unsure or aren't 'into' that type of thing, then you might not enjoy this all that much. They aren't oriented towards any specific religion and nor do they preach to you in any way, but Elizabeth does talk a lot about meditation, yoga, and other different types of spiritual practice. But, with this aside you do also find out a lot about Indian and Balinese culture and the people she meets along the way, as she does go into fun detail about these.